Wise words to live by. If one tries to be positive in one's own life, he is more likely to avoid the evil influences of others. This is a very old idea, originating in Japan, (but possibly China?! ), several hundred years ago. The basic Japanese belief is about staying healthy by behaving well. 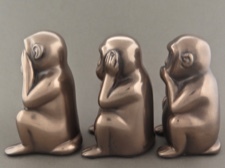 This set of wise monkeys are cold cast from bronze powder mixed with resin. 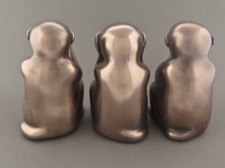 The smooth finish has a warm, durable bronze luster. 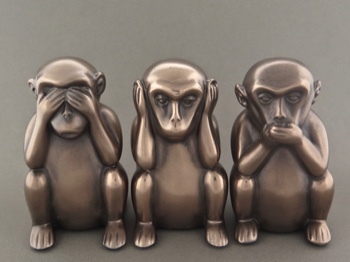 Each monkey is 3 inches tall with a base of 1.75 x 1.75 inches.